The empire in one city? From the late eighteenth century to the early twentieth century, Liverpool was frequently referred to as the ‘second city of the empire’. Yet, the role of Liverpool within the British imperial system and the impact on the city of its colonial connections remain underplayed in recent writing on both Liverpool and the empire. 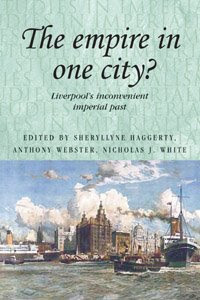 However, ‘inconvenient’ this may prove, this specially-commissioned collection of essays demonstrates that the imperial dimension deserves more prevalence in both academic and popular representations of Liverpool’s past. Indeed, if Liverpool does represent the ‘World in One City’ – the slogan for Liverpool’s status as European Capital of Culture in 2008 – it could be argued that this is largely down to Merseyside’s long-term interactions with the colonial world, and the legacies of that imperial history. Click on the title above for more information on this book.